The mission of our lab is to build self-contained microsystems that will combine and process natural signals (such as bio, chemical, optical and thermal signals) as well as electrical signals on a single chip platform by integrating new MEMS/nano structures with low-power, wireless VLSI circuits and systems. Currently, we have three main research thrusts: microfluidic systems, MEMS neural interfaces, and CMOS imaging and neural interfacing ICs. The research of Biomedical Interfaces is all about innovation of new human machine interfaces through skin, heart, central and peripheral nervous system. 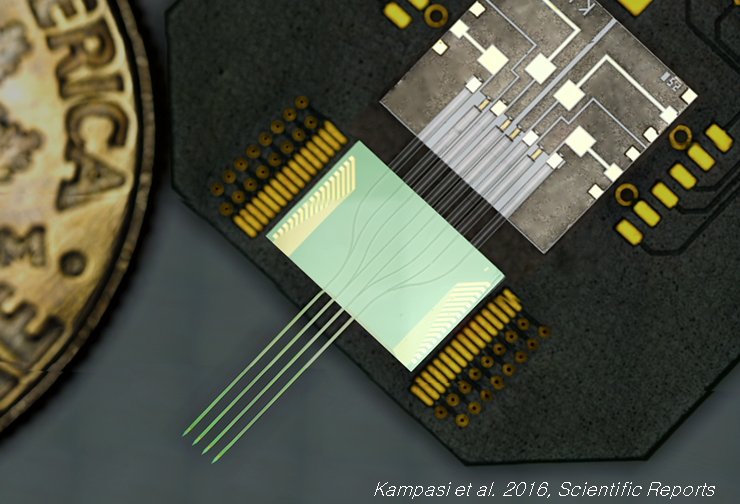 Our neural interfacing circuit research is devoted to innovation of state of the art brain-machine interfaces, high density neural recording, and stimulation microsystems. Miniaturized biochemical analysis system can be applied to autonomous instrument for environmental field measurement, automatic chemical analyzer and biomedical field such as blood analysis, micro dosing system, DNA analysis and etc. In our lab, we focus on high-throughput single-cell assays to characterize individual cell properties. CMOS image sensors (CIS) provide miniaturized, low-power and low-cost solutions for a variety of imaging applications. Our research focuses on low-power imaging for wireless sensor node, optic flow sensor for micro-air vehicles, three-dimensional depth imaging, and optical cancer diagnosis.